Here is one more little peak at what Dark Chocolate metal from Ten Seconds Studio can do for you!!!! This cover and back of a Bind-It-All book also shows what the steel brush does to accent the embossing. The cover is a single mold and the back uses 3 in different strips. Just got the newsletter from Cloth Paper Scissors Embellishments. This was supposed to run in September, but Cate sent an email today and said they decided to run it this week. Surprise!!! Thanks, Cate! 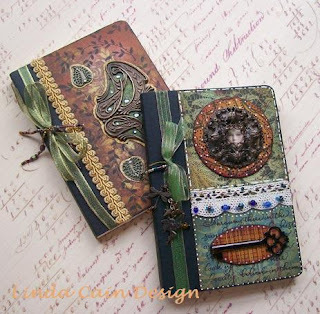 "Linda takes pre-bound or handmade journals and uses layers of background stamps and Distress™ inks to create depth. She hand paints chipboard shapes and applies pictures of children, brass elements (Linda uses Vintaj® jewelry findings, but you could also use found objects), or both. Then she glues the embellished pieces onto the covers. Finally, Linda trims out the books with cording, ribbons, brads, beads, jewels, charms, and her signature pen marks. If you're inspired by Trudi and Linda's ideas for decorative journals, make some of your own with inexpensive composition books, and products from our online store like Distress inks, Grungeboard shapes, and our Back-to-School Bargains (see below)." That's all for today...working on kits for class...times flies! Large Fragment and Alcohol Inks! WOW! What colors you can get!!! Is this striking or what??? I mean it's not like rocket science or fine art, but it was a trip. No experience or license needed. I used Cranberry, Rust, Eggplant and some Pitch Black Alcohol Inks. Of course the stamp is Tim's from the Regal Findings set. This is what we will be working with in Oct. in Bloomington. Come join the fun. This is what you girls voted on for the next class. So, by popular demand here is the Christmas in October book we'll be putting together at Scrapbook Friend'z on the 12th. It's a Bind-It-All class again, so we'll get more practice with that little jewel. And bring your alcohol inks and applicators because we're going to figure out something special to do with them, too!!! These are certainly using the jewel tones for a bright and cheerful Christmas Book that you can give or keep for your little self. Here's the breaking news! In April I am teaching at For Keep Sakes. That's not the news, but Tuesday I spoke to Stephenie Hamen at Cloud9/Fiskars and they are going to sponsor me at Scrap St. Louis in my classes!!!! WOW!!! Did I die and go to heaven???? These ladies are soooooo nice! Amy and Nancy are the girls who started this company and still have their creative fingers in it. Thank you guys for everything!! This is the bookbox that I LOVE!!! They have white, black and this color, kraft. No painting necessary and all paper is applied flat....no going around corners!!! The book fits inside so nicely. I made one last Christmas for a shop sample and it was really great to put together. Terrific quality in the product. The papers, stickers, rub ons and quote cards are from the Cocoa Mint and Cinnamon Stick collection. Wonderfully coordinated for color and the embossing on the papers is too cool!!!! Really! You can't see it as well in the picture, but it's there. The glitter on some of the flowers is very classy. And glitter rub ons!!!! They were really slick. FUN ~ FUN ~ FUN!!!! And I'm not easily impressed!!!! Can't wait to see what's in the pipeline that we can use for April.....you'll be the first to know. Linda aka a VERY happy camper! Well the class went off without a hitch. Here's a picture, I guess there was something important being discussed at the time!!! Ha! I think we all had a great time and the books were fabulous! Beautiful work ladies, and you all did it yourselves! WOW! They are all experts after today. I can see what everyone is going to get for Christmas presents in your families. Thanks girls, you were a treat! I'm here to bore you again with a garden shot! But at least this time it has a beautiful butterfly in the picture. This baby had about a 6" wingspan and didn't care if I got right up in her face to shoot the picture. Still a couple of openings in the classes in St. Louis in Sept, but they are filling up! That's good news. Tomorrow on to Bloomington to teach the Bind-It-All class. Although it's full, you could still drop by and say hello! Can't wait girls! Classes are up at the For Keep Sakes site!!!! Come and join the fun!!!! In both classes I will teach you to use the metal from Ten Seconds Studio that is sooooo easy. It lets you look like a pro with little effort. I KID YOU NOT! You will love this stuff. The only tools you need to make these is a sanding block, a stump, and a mold. The stumps and molds are provided for you. Please bring a sanding tool. And I'll demo all the other tools from my collection, and you can try them! We'll make at least 2 pins and a slider necklace to hide little treasures in. Decorate the pins with ribbons and dew drops and jewels. The sky's the limit with your imagination on this project!! The Maya Road book has 11 sides to decorate. You can bring little pictures of family to put in it. Or just use the flowers and stamps to adorn the pages along with the jewels, chipboard, and buttons that come in the kit. Lots and lots of stuff to fill the book. Can't wait to see all of you again! Here are the 2 latest additions to the Vintaj books for Galena. They are my attempt at a bit of oriental style. The colors DO match, trust me, but the Distress Stickles seems to photograph a bit differently. Anyway Maya Road ribbon and CB Blossoms, Autumn Leaves clear stamps, Basic Grey Blush papers, and of course, Distress Inks. The Grungeboard pieces are a great background for the metal findings. This is what I added to the "make and take" from Advantus at CHA with Tim's Idea-ology pieces!!!! SOOOO fun. Using some alcohol inks on an old locker pin, and nothing on the antique key hole made the project very easy. String a few beads on eye pins and add with a jump ring. If anyone knows where I got that terrific chain I put these on, I would love to know. Great colors. I think I bought it years ago at the Rockford convention. But I've slept since then. To those who asked about it in Chicago, I'll post the company if anyone figures it out! **Thank you soooo much Moose Ridge!!! Bonnie's Best does in fact carry a chain that looks just like mine. Art Friends are the BEST!!!! I haven't been very good about blogging lately. But entries without pictures are somewhat boring, and I can't show you what I've been working on. Not a national secret, but some are being mailed off. We'll see. Anyway, last night at about 10:30, I decided to redo my tool rack that holds my Ten Seconds Studio tools! (My daughter thinks it looks like something out of a "Mad Dentist's" office). DH made it for me and I had it decorated with metal tape that I no longer liked. So, out came the tools, the newer black metal and by midnight I had a better looking holder than before! This is what you can do with the molds and the metal. Front and back. Seriously!!!!! Isn't it too cool?!?!?! And very easy to do. Join the fun in St. Louis in September.